DALLAS – To give military shoppers peace of mind this holiday season, the Army & Air Force Exchange Service is extending its return policy for items purchased between Nov. 1 and Dec. 24. The Exchange’s standard policy allows returns anywhere from up to 15 to 90 days of purchase with a sales receipt. The holiday return/exchange policy extends these terms through Jan. 31, 2016. Shoppers can also return items purchased through shopmyexchange.com at their nearest brick-and-mortar Exchange. For more information about the extended refund policy, shoppers can visit customer service at their nearest Exchange. DALLAS – The Army & Air Force Exchange Service, along with Nautilus, is commemorating the 50th anniversary of the Vietnam War with an essay contest to honor the heroes who served and the “battle buddies” who saw them through. With the Exchange’s My Vietnam Battle Buddy essay contest, Exchange shoppers are invited to share stories of their Vietnam War battle buddies and how their lives were affected by their time of service together. The first-place winner will take home a Schwinn 470 Elliptical valued at $799. Second place wins a Schwinn 270 Recumbent worth $469, while two third-place winners will each receive a Schwinn 170 Upright valued at $379. From Oct. 30 through Nov. 20, authorized Exchange shoppers can send their essays to patriotfamily@aafes.com. Entries must include full name, mailing address, email address and telephone number. Essays should be 200 words or fewer. The My Vietnam Battle Buddy essay contest is part of the Exchange’s participation in the 50th Anniversary Vietnam War Commemorative Partner Program, designed for federal, state and local agencies to thank and honor Vietnam veterans and their families. Additional information and instructions can be found at the Exchange’s Patriot Family Connection site at www.shopmyexchange.com/patriot-family. DALLAS – The Army & Air Force Exchange Service is making holiday wishes come true for military shoppers by picking up the tab on their MILITARY STAR® card up to $8,200 with the “Your Holiday Bill Is On Us” sweepstakes. From Nov. 1 through Dec. 31, shoppers will be automatically entered in the sweepstakes each time they use their MILITARY STAR card to pay for purchases at any Army or Air Force Exchange location or on shopmyexchange.com. Each transaction counts as one entry. 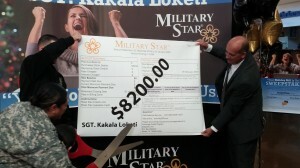 Three grand-prize winners will receive their MILITARY STAR card bill paid in full up to $8,200 with a minimum prize of $2,500. Ten second-prize winners will be awarded a $1,000 credit on their MILITARY STAR card statement, while 25 third-place winners will earn a $500 credit. Winners with a balance less than their prize amount will receive a credit on their account. In 2015, the sweepstakes changed the life of one grand-prize winner. Sgt. 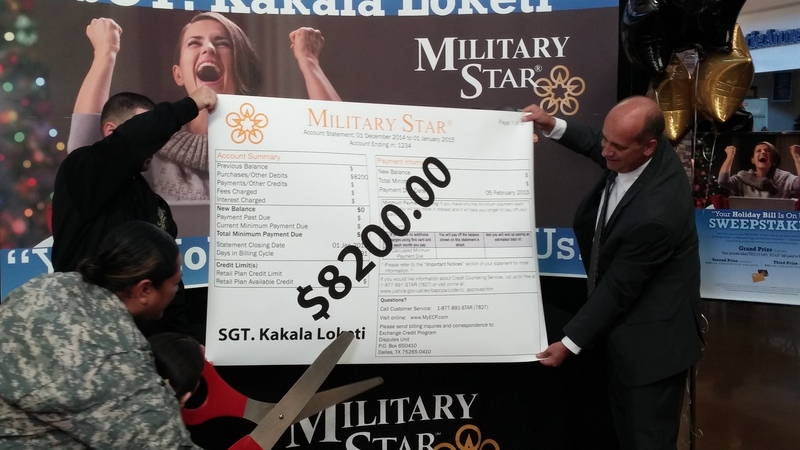 Kakala Loketi had her MILITARY STAR account paid in full during a presentation at Freedom Crossing at Fort Bliss, where she took scissors to an oversize credit card statement, symbolizing her $8,200 bill being wiped clean. This holiday season, all shoppers who pay with their MILITARY STAR card will get something back thanks to a new rewards program. All MILITARY STAR cardholders earn 2 points for every $1 spent in Army, Air Force, Marine Corps, Navy and Coast Guard exchange stores, and wherever else the MILITARY STAR card is accepted. For every 2,000 points earned, shoppers automatically receive a $20 MILITARY STAR rewards card. Winners of the “Your Holiday Bill Is On Us” sweepstakes will be announced on or about Jan. 30. 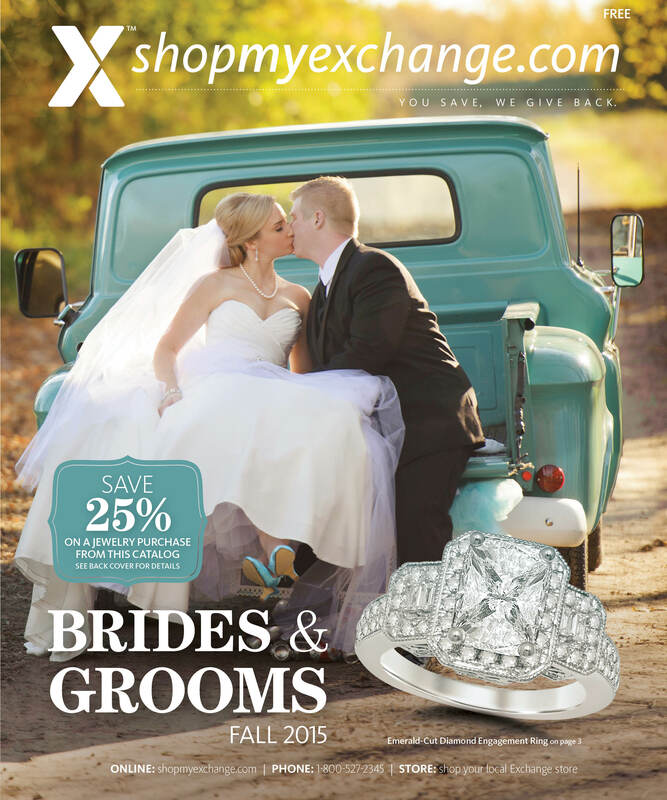 DALLAS – Military shoppers looking to pop the question this holiday season can turn to the Army & Air Force Exchange Service’s Brides & Grooms Fall 2015 catalog for a shining selection of diamond jewelry that’s a cut above the rest. The 36-page catalog is packed with diamond engagement rings, bridal sets, weddings bands and other jewelry to celebrate the joy of marriage. A selection of pearls, pendants and earrings will help brides complete their wedding-day looks. Timeless timepieces from Tag Heuer, Versace, Michael Kors and more put the finishing touches on grooms’ ensembles. Prices in this all-services catalog are valid through Dec. 31, for any authorized Exchange customer. Active-duty military members of the Army, Air Force, Navy, Marines and Coast Guard, as well as military retirees, reservists, National Guardsmen, Department of Defense civilians stationed overseas, Exchange associates and their family members are all authorized to receive Exchange privileges. 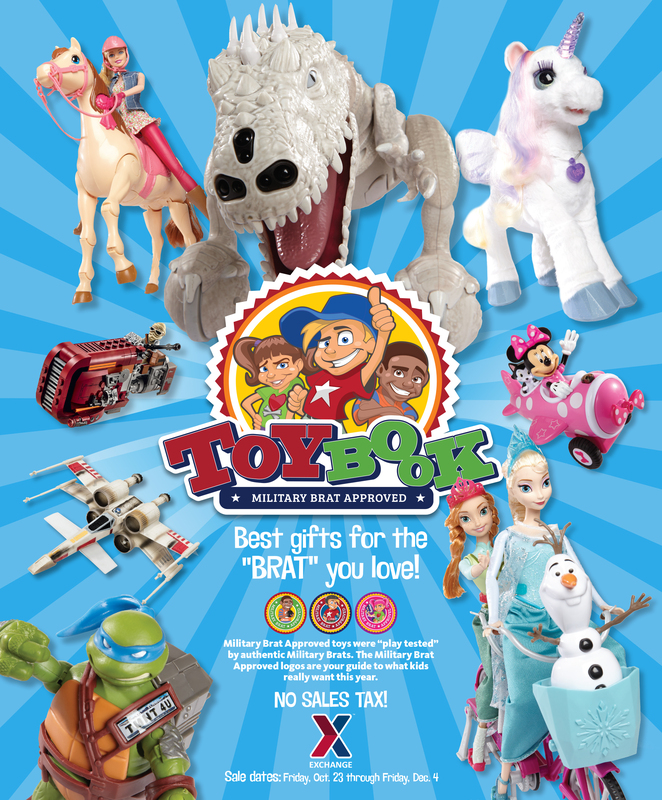 DALLAS – Military shoppers can fill their sleighs with the hottest toys for children of all ages this holiday season with help from the Army & Air Force Exchange Service’s Toy Book, which features a selection of gifts both in-store and online. Inside the guide, shoppers will find the latest from Disney, Barbie, FurReal Friends and more. “Star Wars,” Marvel and Teenage Mutant Ninja Turtle action figures join the fun as well. Go-to gifts such as video game systems, bicycles and scooters can also be found. For those who want to shop online, shopmyexchange.com is loaded with the hottest toys. Online purchases ship for free when shoppers use their MILITARY STAR card. Shoppers also earn 2 rewards points for every $1 spent with their MILITARY STAR card. Prices in the Toy Book are valid through Dec. 4. The Toy Book is available at Exchange locations worldwide. To find the nearest Exchange, shoppers can visit www.shopmyexchange.com/exchange-stores/. DALLAS – Across the globe, associates at the Army & Air Force Exchange Service’s retail stores and restaurants embody the organization’s core value of “family serving family.” But even associates who don’t typically work directly with military shoppers still exemplify this core value at the very heart of the Exchange’s mission. Jutta Peterson, a contingency operation s specialist in Human Resources at the Exchange’s headquarters in Dallas, recently put “family serving family” into action by helping a Soldier get a last-minute passport for her daughter before a permanent-change-of-station move to Korea. Peterson is a certified military passport agent at the Exchange, and she’s able to process and receive passports designed for official military travel. This summer, she received a call from chief of the Department of Defense’s Passport and Visa Office in Virginia. Military passports must be delivered to military passport agents—they can’t be sent to home addresses, Peterson said. Instead of having the document sent to the military passport agent at Fort Sill, Okla.—roughly three hours away from Dallas-Fort Worth—Peterson told the passport chief that she’d handle receiving the paperwork at the Exchange’s headquarters. “I said, ‘No problem! I’m happy to help her get the passport, instead of having her driving all the way to Fort Sill,” Peterson said. The day before the flight to Korea, the Soldier and her daughter met Peterson at Exchange headquarters, and she handed off the passport. 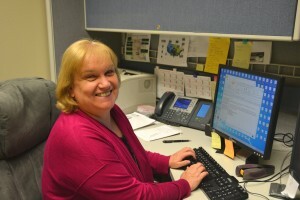 Arna Yarbrough, the Exchange’s chief of career assignments and Peterson’s supervisor, praised her willingness to alleviate a stressful situation for a military member. For Peterson, her helpfulness is just part of her nature. 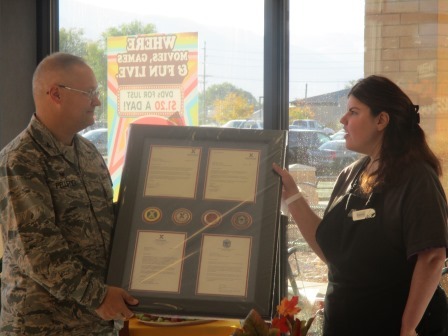 HILL AIR FORCE BASE, Utah – Patricia Barson grew up with a servant’s heart. Her winning smile and kind spirit endear her to the Hill Air Force Base Airmen, families and retirees she serves at her part-time job as a cashier at Taco Bell at the Hill AFB Exchange Food Court. Barson’s inspiring attitude helped her earn the Outstanding Department of Defense Employee with a Disability Award. The Army & Air Force Exchange Service associate will be honored at a ceremony at the Pentagon Oct. 29 in Washington, D.C.
Barson lives with physical limitations related to being separated from her conjoined twin sister in 1984, when they were just 6 months old. She and her sister, Ashley, who also works at the Hill AFB Exchange food court, were the second set of twins joined at the cranium to survive a separation surgery. During the surgery, both sisters suffered strokes and are impaired on their left sides. Hill Exchange managers and Col. Dana Pelletier, 75th Mission Support Group Commander, honored Barson, her twin sister and her family during a special presentation Oct. 16 at the Hill AFB food court. Barson received a plaque, certificates and plenty of well-wishes ahead of her big trip to Washington to accept her official award. The Barson twins—the youngest of six children—grew up in a military family. Their father, retired Air Force Col. Aaron Barson, says he and his wife, Kathie, instilled their children with selflessness and a love for serving others. Ashley Barson, who buses tables, greets diners and handles other duties in the food court, is her sister’s biggest fan. As she looks to the future, Barson sees herself continuing to serve Airmen at Hill. DALLAS – The Army & Air Force Exchange Service is treating military shoppers to extra savings just by shopping from Oct. 16 to 17. When shoppers make a purchase during those two days, they will receive a coupon to use while shopping from Oct. 21 to Oct. 25. Shoppers can save $10 on a purchase of $100 or more or $20 when spending $200 or more in stores or on online at shopmyexchange.com. The coupon is valid in-store or online at shopmyexchange.com. DALLAS – The Army & Air Force Exchange Service is making it easy for military shoppers to create an inviting atmosphere for fall guests with a host of name-brand merchandise in the Dining & Entertaining 2015 catalog. The 36-page catalog is packed with products both in-store and online at shopmyexchange.com that are sure to please a crowd. Military shoppers can prep for guests with chef-quality cookware from Le Creuset, Calphalon and more. Countertop staples from KitchenAid, Cuisinart, J.A. Henckels and other name brands join the party as well. Military shoppers will also find Lenox holiday dinnerware, Waterford sparkling glassware and Ashley dining room furniture. TVs and speakers from Samsung, Sonos and Bose help shoppers create the perfect environment for celebrating at home. 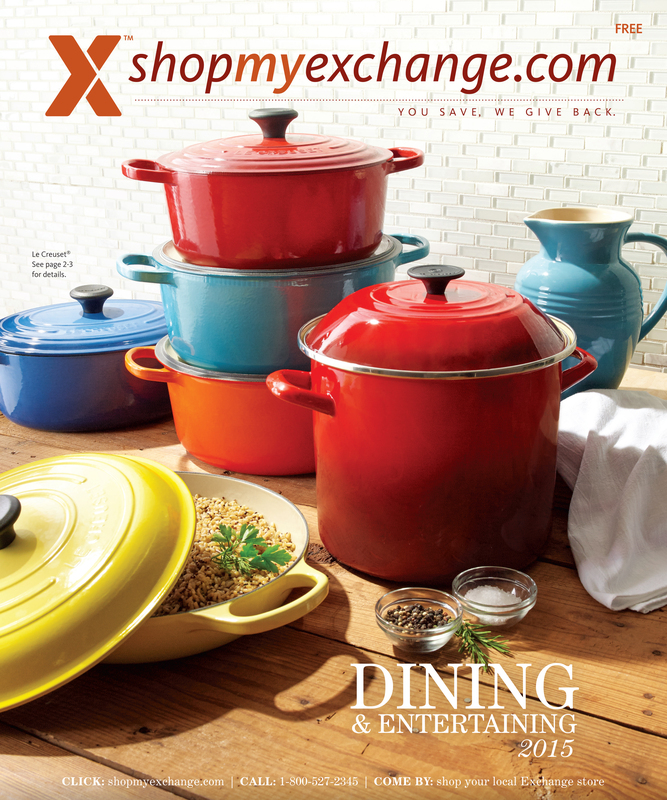 The Dining & Entertaining 2015 catalog is available at main stores and online at www.shopmyexchange.com/savings-center/interactive-product-catalogs. Prices in this all-services catalog are valid through Nov. 12, for any authorized exchange customer. Active-duty military members of the Army, Air Force, Navy, Marines and Coast Guard, as well as military retirees, reservists, National Guardsmen, Department of Defense civilians stationed overseas, Exchange associates and their family members are all authorized to receive exchange privileges. 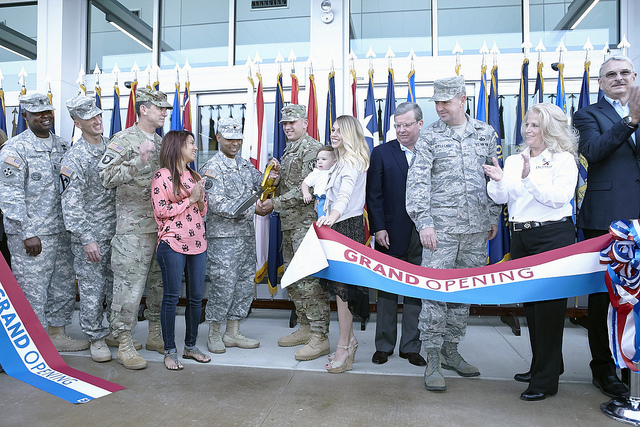 FORT HOOD – The Army & Air Force Exchange Service cut the ribbon on its brand-new Clear Creek Shopping Center on Oct. 1, bringing a modern shopping experience complete with a strong national brand presence to the Fort Hood community. Col. (P) JP McGee, Fort Hood deputy commander of support, 1st Calvary Division, told the crowd he knew the new shopping center would have a lasting impact on the community. Shoppers made their own grand-opening memories, some by arriving at 1 a.m. to be among the first inside the $47 million shopping center. By the time the ribbon was cut, hundreds of Soldiers, military families and retirees were waiting in a line that stretched around the building. Nilsa King, whose husband retired from the Army 20 years ago, was the first shopper in line, arriving more than eight hours ahead of the opening. The crowds delighted Exchange General Manager Paula Gunderson, whose team had worked long and hard to prepare for the big day. The shopping center brings the main store, mall and food court under one roof. The main store boasts name-brand “concept shops,” including Michael Kors, Ralph Lauren and Bobbi Brown. A special BE FIT section is stocked with athletic wear for men and women from name brands such as Under Armour, Nike and Adidas. The BE FIT section was a hit with Pvt. Damon Fort, a computer/detection systems repairer with Company B, 115th Brigade Support Battalion, 1st Armored Brigade Combat Team, 1st Cavalry Division. “The BE FIT area is really nice—definitely an upgrade from what we’re used to,” Fort said, adding that he was especially impressed by the wide selection of weights and other fitness products. Military spouse Sandra Ramirez shopped on grand-opening day, checking out the Exchange’s selection of name-brand handbags and accessories. The PowerZone has been amped up with concept shops for latest the Apple, Sony and Bose products. For families, the bright, inviting childrenswear section showcases fashionable kids clothing at prices Mom and Dad can afford: $5, two for $15, $10, $15 and $20. Shoppers found more national names in the mall, including Great Clips and It’Sugar—the first-ever locations for these brands at an Exchange. National brands like MAC cosmetics, Sally Beauty Supply, GameStop and Starbucks are also present, giving the mall a modern look and feel. Feven Armstrong, whose husband is medically retired from the Army, made the MAC store her first stop. Besides the main store and mall, military shoppers packed the food court as well. Diners have plenty of options to choose from, including Smoothie King, Boston Market and The Den by Denny’s. For Gunderson, seeing the community enjoy the store, mall and food court was worth the wait. “I hope the community enjoys this new shopping center, not just today, but for years to come,” she said. Additional grand opening photos can be found here.